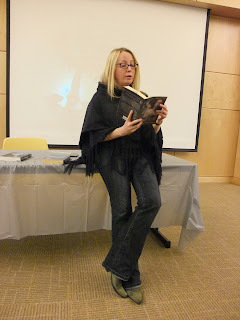 The Paperback Princesses: Author visit, CPL Newcastle Branch - Lesley Livingstone. Author visit, CPL Newcastle Branch - Lesley Livingstone. 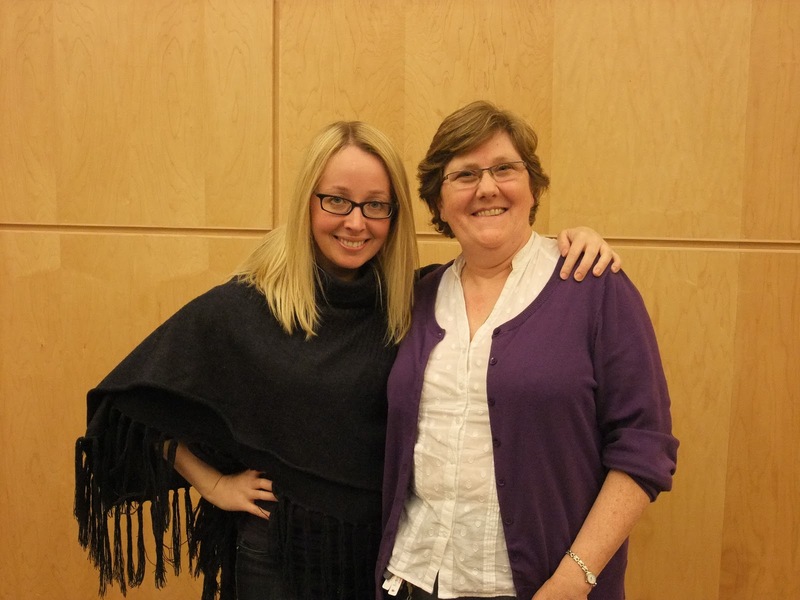 I was absolutely thrilled on Thursday night to be present at the author visit that Lesley Livingstone paid to Clarington Public Library. The visit was part of the Canadian Library Month celebrations. 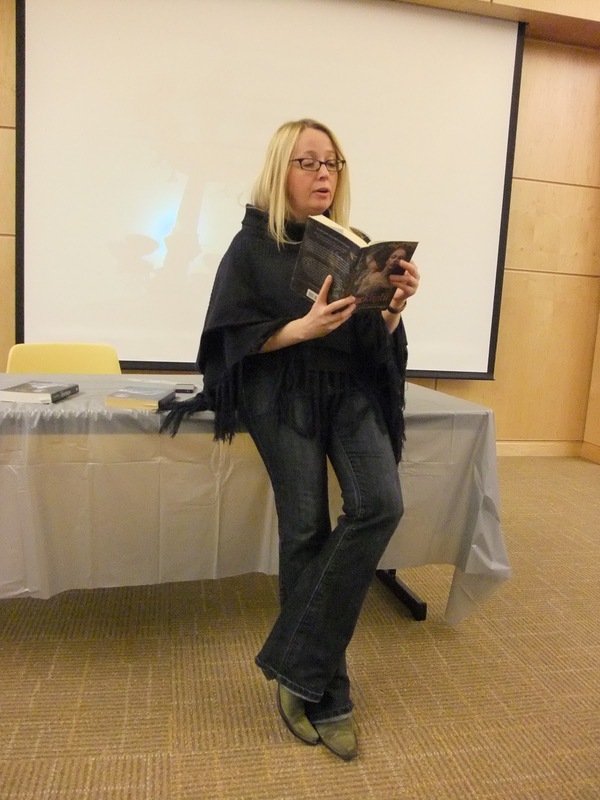 This is a picture of her reading from 'Darklight'. What many of you may not know is that Ms Livingstone is a trained Shakespearian actress and consequently has a wonderful voice, phrasing and diction, with great characterization and accents. It was wonderful hearing her bring her characters to life as she read. As I was listening I realised that I had heard her before - when I was listening to her books on audio. Yep, she narrated all three of them, at the speed of light according to her story, and they were wonderful. I had forgotten just how much I had enjoyed them. If you haven't already listened to them, give them a try. 'Once Every Never' will be followed by 2 more books very tentatively titled, 'Every Never After' and 'Now And For Never' since she hasn't written them yet and of course those titles could change - I hope not, but who knows. She has a new trilogy in the works, set in the same world as Wondrous Strange and with the first volume 'Starling' coming out in summer 2012 To quote Ms Livingstone, this new series 'will do for Wondrous Strange what Angel did for Buffy'. For those of you who don't understand that, let's just say it should be great! She was once kicked out of theatre school, but went on to start her own Shakespearian theatre company! Several of her own personal experiences have found a way into her books - changed a little, or a lot perhaps, but definitely based on actual events. She also does a huge amount of research for her books and finds many obscure facts that she finds uses for, one way or another - such as Andrew Haswell Green's name translating to 'green man in a wild place' - check out 'Darklight' for the significance of that one. Wondrous Strange has been optioned for a movie/tv show - but as we all know, nothing happens until it happens (her own words) so don't hold your breath waiting. Just keep your fingers crossed. I for one would love to see either. She told a wonderful story about her last production of Romeo and Juliet where she was playing the nurse and realised part way through a scene that she was seriously channelling Maggie Smith in her role as Professor McGonigal in Harry Potter. It was absolutely hilarious listening to her and I actually had tears of laughter. After another very funny story about interviewing Hugh Jackman on Wednesday night at the preview of his new movie 'Real Steel' I had to bring out my hankie to wipe my eyes. Thanks to Pither Python for the photos, I really like this one. All in all I had a wonderful time and got all my books signed, yeah, and I apologise Ms Livingstone for being a total fan girl, but I really did enjoy 'Once Every Never'. Thanks for a great evening and good luck with your future books. Oh, and by the way, if you're reading this, you forgot to leave that envelope!